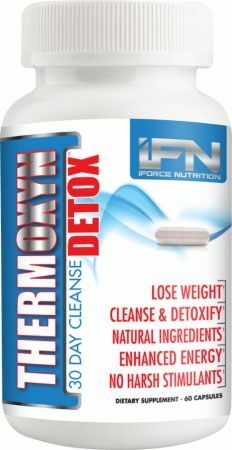 iForce Nutrition Thermoxyn Detox Is ! 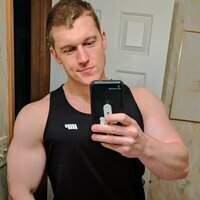 Get the Best Prices on Thermoxyn Detox at Bodybuilding.com! Take the First Step to a Thinner, Healthier, and Happier You! Thermoxyn Detox is an interesting stimulant-free, weight-loss supplement that is designed to cleanse and detoxify the body by utilizing natural ingredients. It is likely that most of the label is full of botannicals that are foreign to most users; a number were foreign to me at first as well or at least I wasn't sure what their proposed effects were. A number of the ingredients in the blend (Cascara Sagrada, Buckthorn Root, Cape Aloe, Bentonite Clay, Aloe Vera, Senna, and Prune Juice) are considered mild laxatives. A number of other ingredients have pre/probiotic properties (Pumpkin Seed, Citrus Pectin, Acidophilus, Oat, Bran, and Flax Seed Oil). Several remaining ingredients may help soothe the digestive tract and protect against indigestion (licorice root, fennel seed, and cayenne pepper). The cayenne pepper and ginger may also provide some cardiovascular benefits as well as thermogenesis, stimulating fat loss. Because the formula is proprietary and the scientific evidence backing the effectiveness of several of these ingredients is tenuous (meaning more research is needed most times, not that the ingredients aren't effective necessarily), I cannot assert with confidence that these benefits will necessarily be gleaned from Thermoxyn Detox use. I really would love to see this formula disclosed and IFN use the bottle design to point out exactly what can be expected from the specific ingredients in their specific doses. The Thermoxyn Detox formula gets a 7/10 because I like several of the ingredient, but I really want to know the dosing. I thought Thermoxyn Detox performed pretty well for me. In the weight loss department, I didn't really notice a difference in my weight, but I really wasn't dieting to lose weight. What I did notice is that my water weight was kept in check better during my 20 days of use. I had less fluctuations in my water weight, looked less bloated after meals, and generally carried less water subcutaneously. In terms of GI health and function, I noticed a decent improvement in my ability to digest large meals without indigestion and my ability to clear meals through my system. I was happy with Thermoxyn Detox's performance there. I didn't really notice any thermogenesis or increased energy from Thermoxyn Detox though. Its performance is 8/10. Overall, I think Thermoxyn Detox is an 8/10 overall as a product. Fennel Seed, Cascara Sagrada, Ginger, Goldenseal, Pumpkin Seed, Buckthorn Root, Licorice Root, Rhubarb, Citrus Pectin, Acidophilus, Acai, Cape Aloe, Bentonite Clay, Aloe Vera, Cayenne Pepper, Senna, Oat, Bran, Prune Juice, and Flax Seed Oil. Take 1-2 capsules of Thermoxyn Detox upon waking with a large glass of water at least 30 minutes before a light, healthy breakfast. You can take an additional 1 capsule before bedtime with at least 8 oz. of water. Be sure to drink a large glass of water the following morning. Warnings: For adult use only. If you are pregnant/ lactating or taking any medications, please consult your healthcare practitioner prior to use. Do not exceed recommended dose. Discontinue use if you experience abdominal pain or diarrhea.